So watch the movie and the slide show, and research for yourself what eating crap you probably shouldn’t be eating anyway is causing in places not your own back yard. And I think you will sit back with the same feeling you had when you first watched “Meet Your Meat” or whatever it was that made you change your life, and you will see why palm oil isn’t vegan. Because vegan isn’t just the letter of the law, it’s the spirit, too. I thought about a title for this post for quite a while. I wanted something that would make you stop and decide to read more. Maybe if the title were “The Best Cheese in the World”, you would stop and look, and by the time you found out it wasn’t about cheese, you would understand why I told you it was. If you are reading this, chances are you are vegan. You have fought your cheese battle and won, fought your cute-leather-shoe battle and made do, fought your chocolate battle and either decided you like dark chocolate because it is way healthier, or — like me — decided to just do without. Your supermarkets are smaller than other peoples’: they have no meat, no fish, and no dairy aisles. Hopefully, I am about to give you one more battle to win, and am about to make your grocery store smaller still. Because palm oil isn’t vegan. When you think of the meaning of ‘vegan’, it doesn’t ONLY mean ‘no animal ingredients’; for most of us, there is a very strong element of ‘no animal suffering‘ and that is why palm oil fails. Palm oil sneaks into almost as many things as dairy does, and causes terrible suffering as more and more forest is destroyed to make way for palm plantations. Critically endangered orangutans, whose last holdout is the Indonesian rainforest of Sumatra and Borneo, are the most visible victims. These only-everso-slightly-different non-humans, whose name means ‘people of the forest’, are chased, shot, poisoned, burned and beaten, and their homeland destroyed and bulldozered at such a rate that according to this short slide show – it may be gone in ten years. Gone. Along with the orangutans, the elephants, the tigers, the rhinos — and an incredibly long list of others, because the Indonesian rainforest contains 12% of the world’s mammal species, and 17% of all known bird species. And it is estimated that more than half of Indonesia’s species have never even been recorded. And at this rate they will disappear unrecorded. A French documentarist named Patrick Rouxel made a short documentary about the palm oil/rainforest crisis, simply called “Green”. Watch it on youtube here. 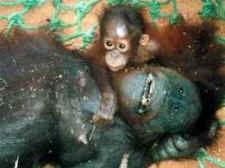 Not all palm oil comes from burning out orangutans and poisoning elephants in the rainforests of Borneo and Sumatra. Some of it comes from Malaysia. Some is termed “sustainable”. The Earth Balance margarine so beloved of vegans contains palm oil, and Earth Balance is proud to say 30% of it is “sustainable”. I freely admit that where animals are concerned, I tend to be a glass-bone-dry person. But if 30% is “sustainable”, what is the other 70%? And where colossal amounts of money are to be made, the word “sustainable” can become as flexible as those standing to profit from it wish. And those palm plantations in It’s-OK-Malaysia? They are being created in someone‘s ex-habitat. Maybe the someone isn’t as heartrending as an orangutan infant, as photogenic as a Sumatran tiger, or as big as an elephant, but their home is being destroyed and burned and bulldozed nevertheless. For crap. The popular mass movement away from trans fats caused a gap that palm oil has filled. It is mainly in processed foods, crackers, chips, cookies, boxed cereals, candy, cake, pastries, bread spreads (check your peanut butter! ),and margarine. It is in about half of all boxed foods. Many of those foods got tossed out in battles you have already won. And luckily none of them are crucial to your survival. Face it: margarine is a cultural habit. You know how many millions of people around the world would look at you blankly if you told them you only eat bread with grease wiped on it? If you don’t want to give up wiping grease on your bread, I can give you a good, easy, much-healthier margarine recipe, and you can make your own from now on. You can also skip that step and use straight coconut oil for everything you used margarine for. Unrefined for a slight coconut taste, refined for no taste at all. And you wouldn’t believe all the health benefits coconut oil is meant to have. Palm oil is also in all kinds of do-you-really-need-them? beauty products, toiletries, laundry and kitchen products, even ones claiming ‘bio’, ‘enviro’ or ‘green’ status. (Btw, PETA has a great list of excellent DIY, completely cruelty-free beauty and cleaning agents.) 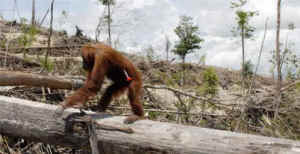 The following list of foods and other products containing palm oil comes from BOS (Borneo Orangutan Survival) Australia. Many of the things listed are non-vegan and so you would not be eating them anyway, and many are specifically Australian, but the list will give you a very good idea what foods to suspect in the US, too. So watch the movie and the slide show, and research for yourself what eating crap you probably shouldn’t be eating anyway is causing in places not your own back yard. And I think you will sit back with the same feeling you had when you first watched “Meet Your Meat” or whatever it was that made you change your life, and you will see why palm oil isn’t vegan. Because vegan isn’t just the letter of the law, it’s the spirit, too. And we are strong people when it comes to giving up things and not looking back. So much so, I don’t think you will mind that I just bulldozed another aisle or two of your supermarket.